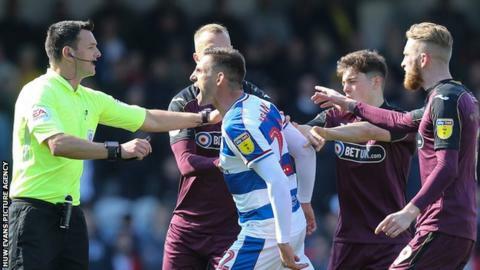 Angel Rangel has apologised to Swansea City fans after reacting to social media messages he received before their 4-0 defeat by Queens Park Rangers. Swans legend Rangel was criticised for gesturing towards supporters during the Championship match at Loftus Road. Rangel has also explained an Instagram post appearing to call for Swansea's American owners to leave. "I would like to apologise to any Swansea fans who feel disappointed," Rangel told BBC Sport Wales. "I didn't mean to hurt the loyal fans who have supported me for years. "We won the game and I felt good. I tried to show the anger I had to the fans who disrespected me during the week. "It didn't come across that way. The moral of the story is I don't think I should have done it." Rangel enjoyed an 11-year Swans career which featured two promotions and a League Cup triumph before being released last May. He was part of the QPR side beaten 3-0 at the Liberty Stadium last September. Ahead of last Saturday's return fixture, the veteran right-back received a number of messages questioning how he would cope with Swansea's in-form winger Daniel James. But as Swansea toiled at Loftus Road, Rangel pointed towards his pocket in reference to James' quiet afternoon. He also made an arm gesture after being booked for a foul on James - but has insisted that was aimed at Swansea players for not putting the ball out of play when one of his team-mates was down injured. "I got many messages, some of them private and some of them not private, which I felt quite angry about," Rangel said. "Some of the comments were horrible. It wasn't thousands of messages but there were many. It's probably my own fault for taking them to heart. "But football is a game of emotions, especially when you play against your old club. I couldn't hold the emotions in and that was a mistake. "My second mistake was to go on social media trying to explain why I was pointing to my pocket." Rangel, whose family remain in south Wales, hopes his relationship with Swansea's fans will not be harmed. He added: "Swansea is my club. It is not my team now but it is my club. The people I loved most at the club were the fans and I will always wish the club well. "If the fans criticise me now I will understand, but I hope they will not. I made a mistake and I put my hands up." Rangel was unhappy with the way his Swansea exit was handled. He had hoped to secure a new contract at the club, while he also saw a possible move to DC United - where Swansea owners Jason Levien and Steve Kaplan are co-chairmen - fall through. Rangel finished an Instagram post about QPR's win over Swansea with a "#yanksout" hashtag. "The ones I am not happy with are the board - I didn't like the way I was treated," Rangel explained. "It's football and I understand they have to make the decisions, but I felt I got messed about a bit."